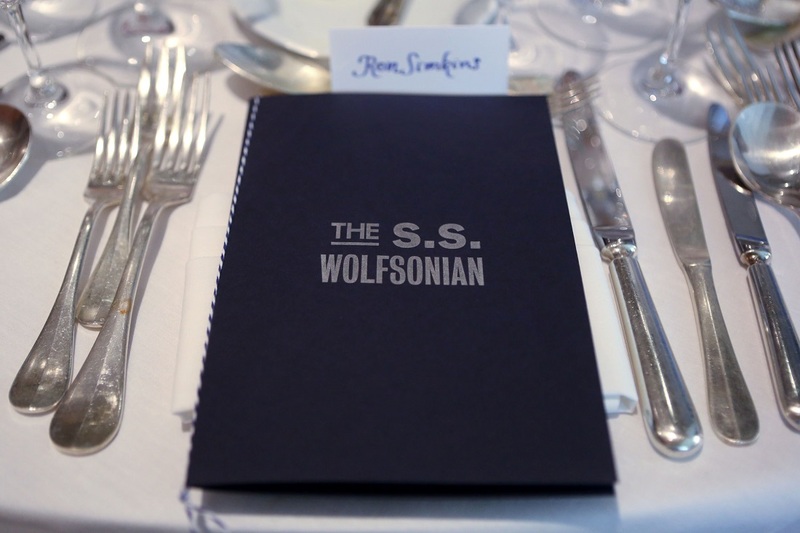 This last Friday evening, as South Beach was celebrating its 13th annual Wine & Food Festival, Azamara Club Cruises hosted a dinner extravaganza aboard the S.S. Wolfsonian inspired by the historical ocean liner menus in the museum’s collection. 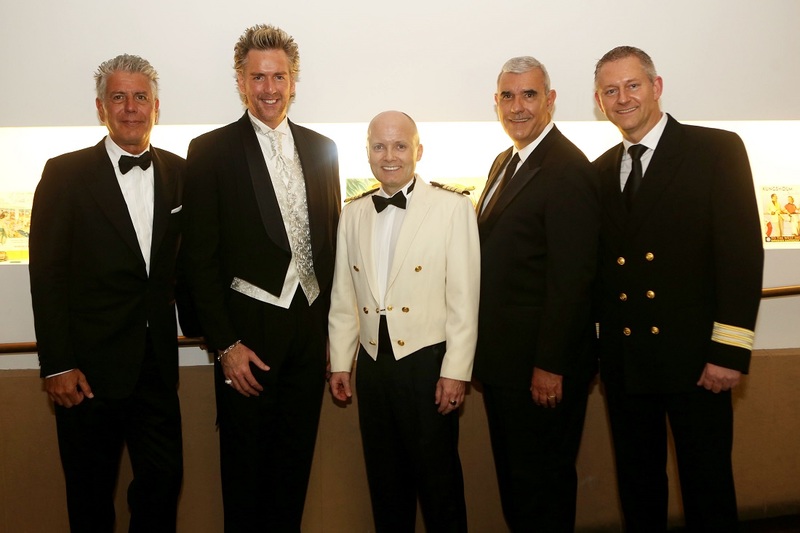 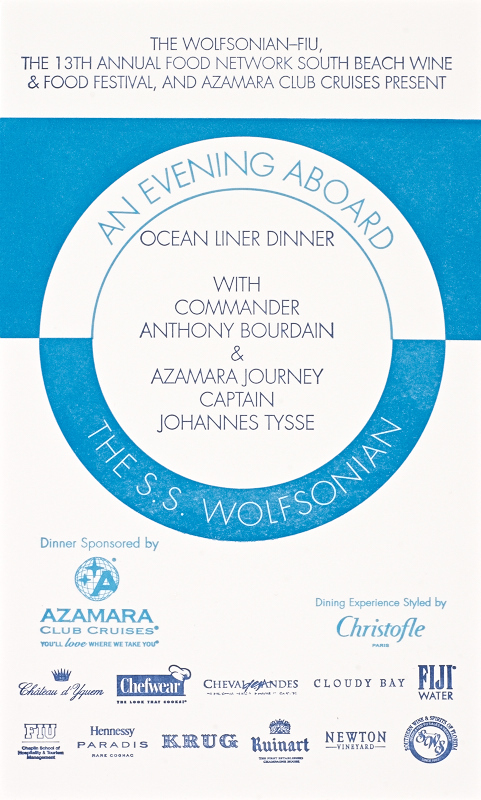 Those passengers fortunate enough to have booked tickets early to this sold-out event were greeted on deck by Azamara Club Cruises’ Johannes Tysse, CNN host, author, and chef Anthony Bourdain, and others. 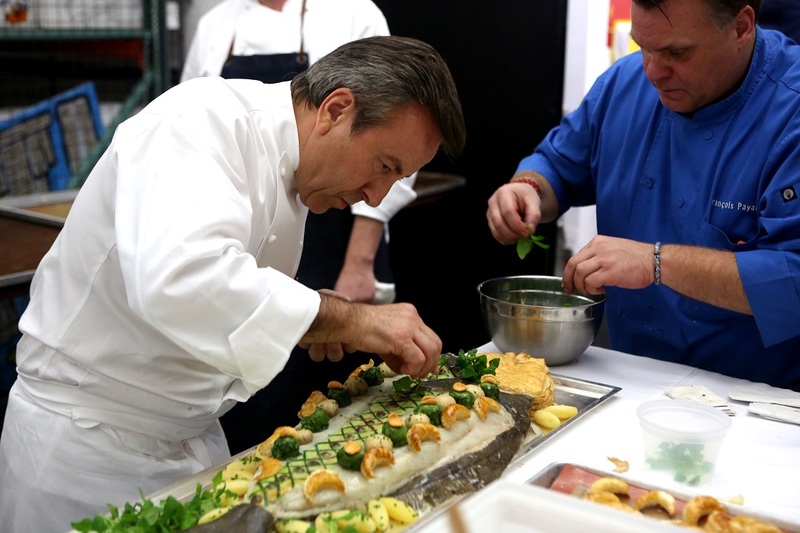 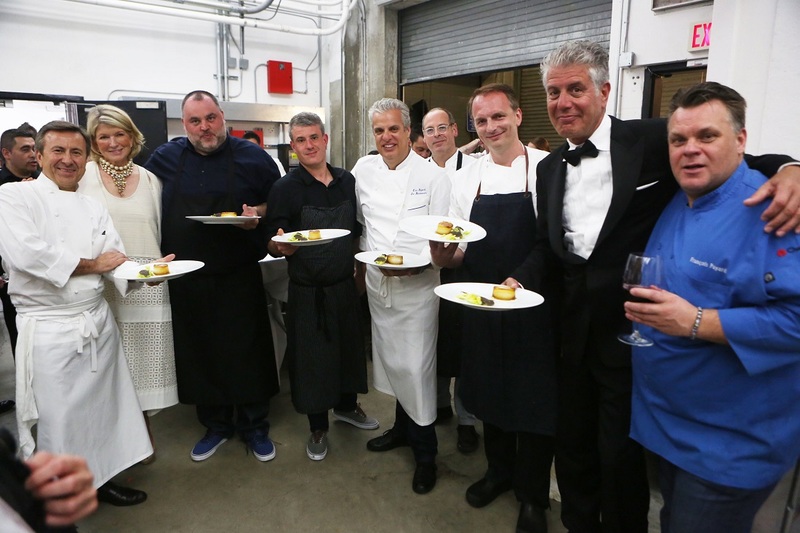 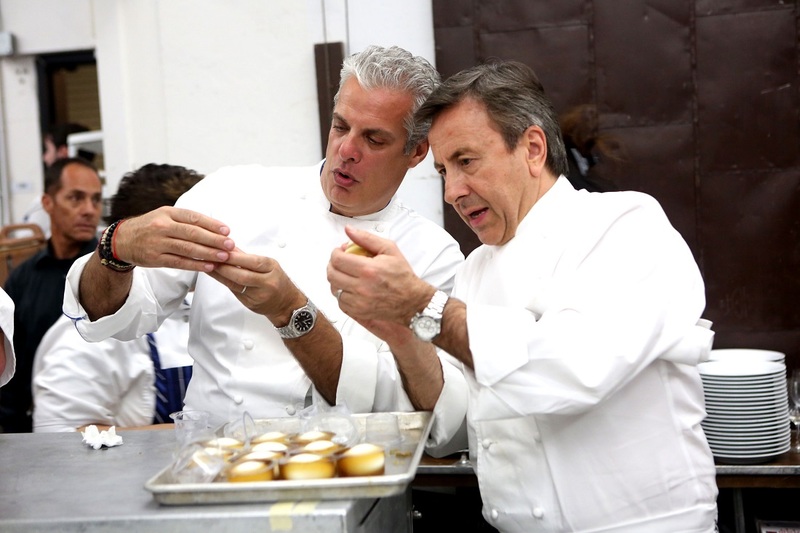 Bourdain oversaw the multicourse menu prepared at The Wolfsonian-FIU by such world-class celebrity chefs as Daniel Boulud, David McMillan, Frederic Morin, Eric Ripert, Andrew Carmellini, and Francois Payard. 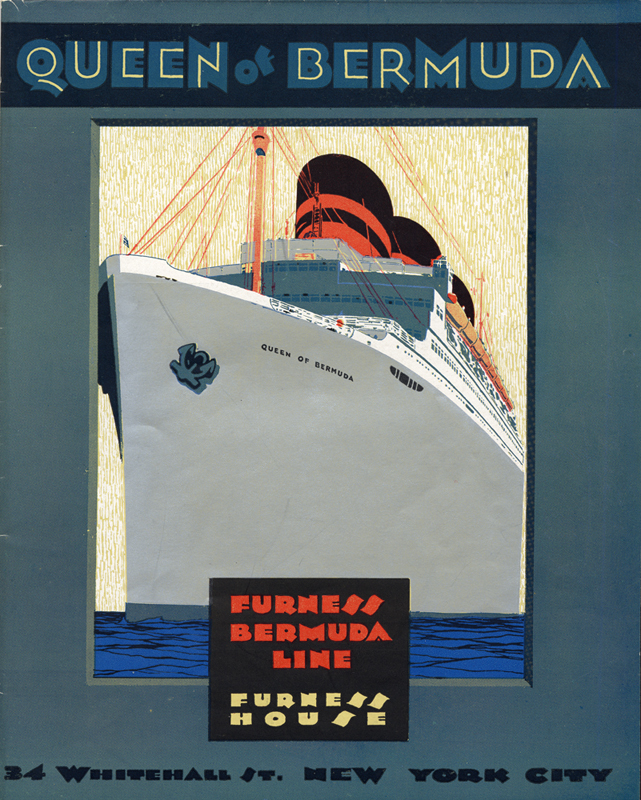 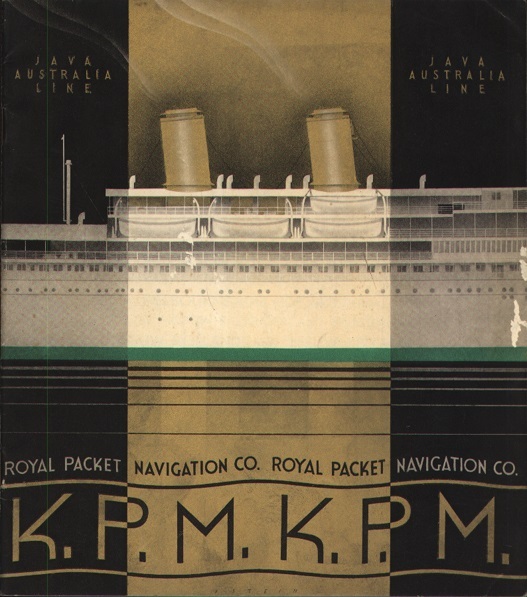 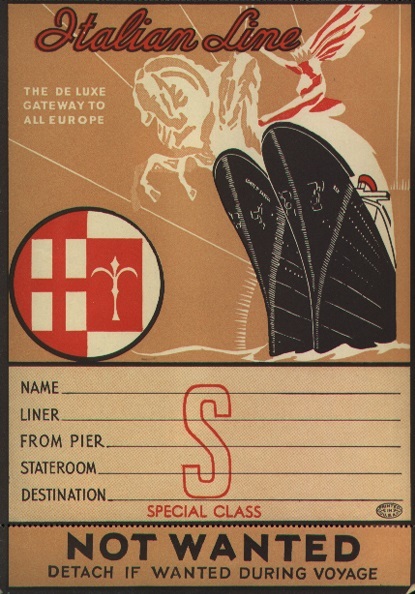 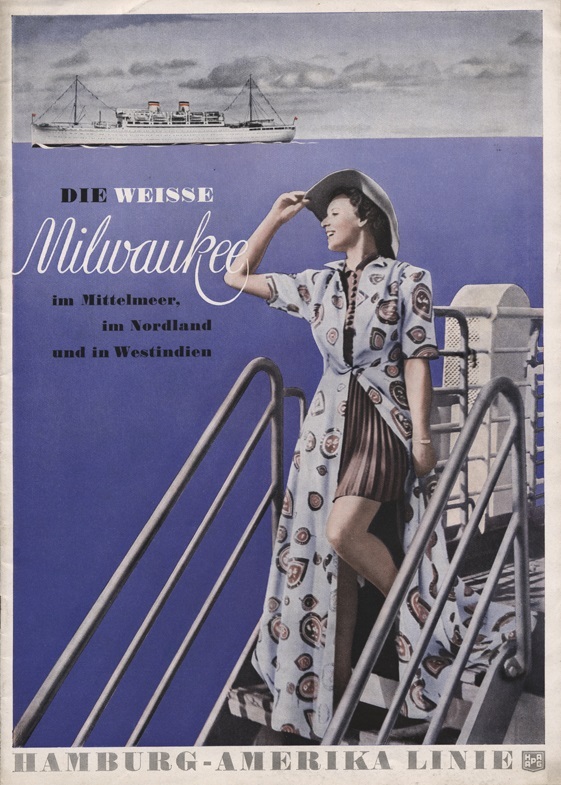 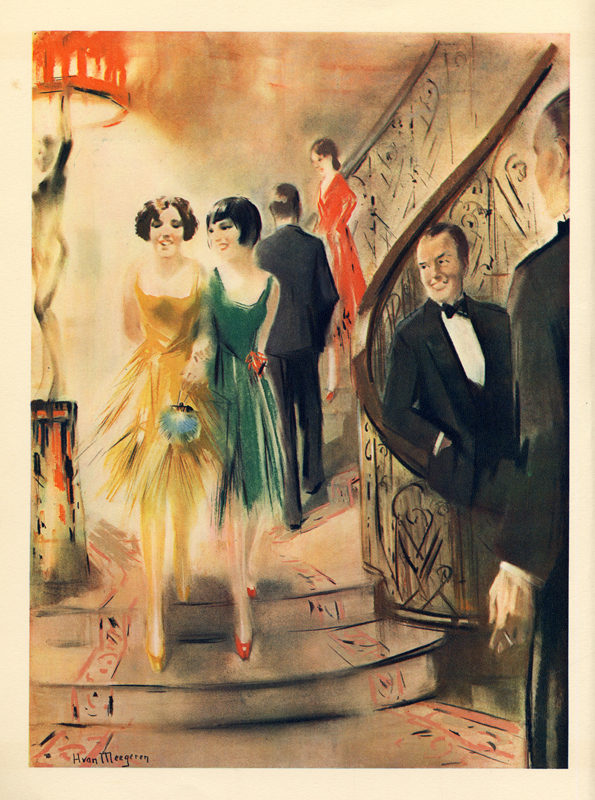 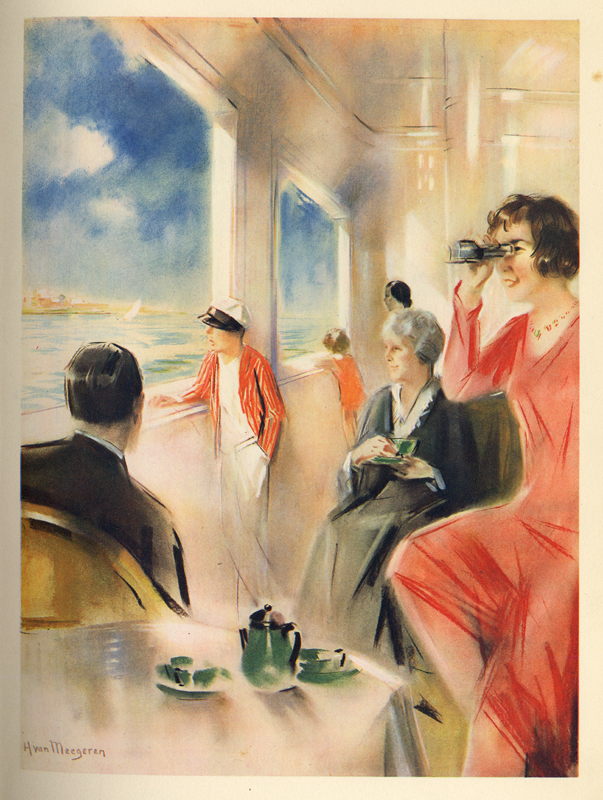 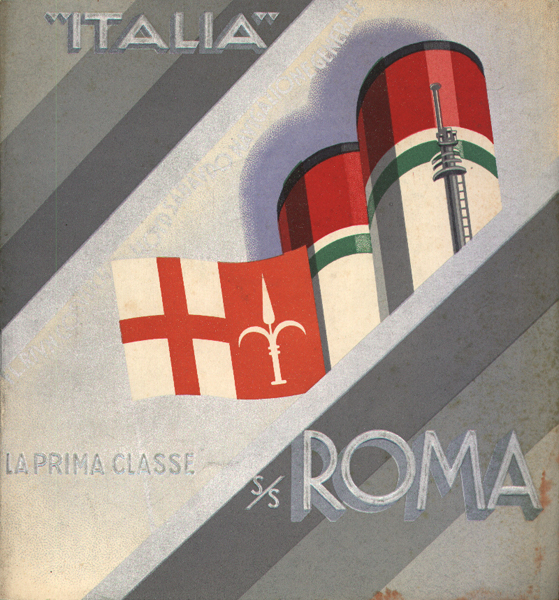 For those of my readers unable to attend, I thought that I might provide you with a “behind the scenes” glimpse into the preparations made for the arrival of the first class passengers, and a taste of our extensive holdings of ocean liner and cruise line industry promotional materials from the interwar and postwar periods. 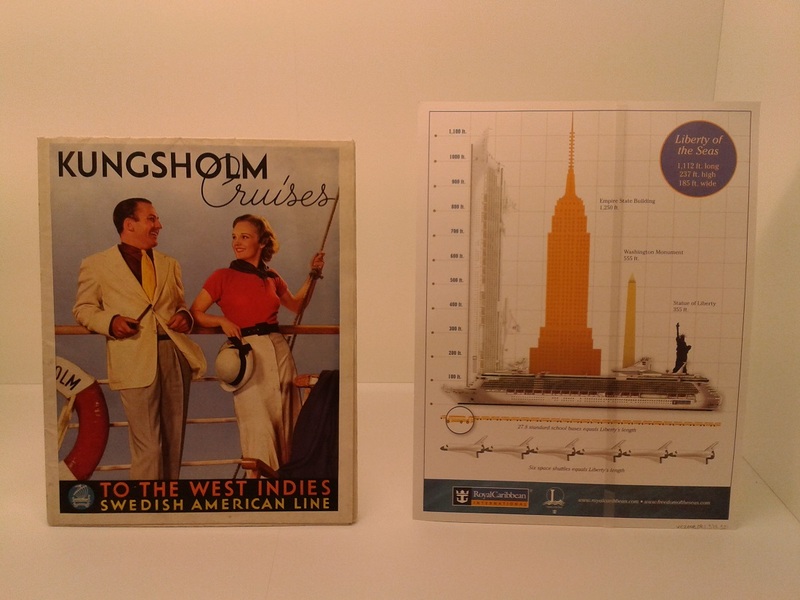 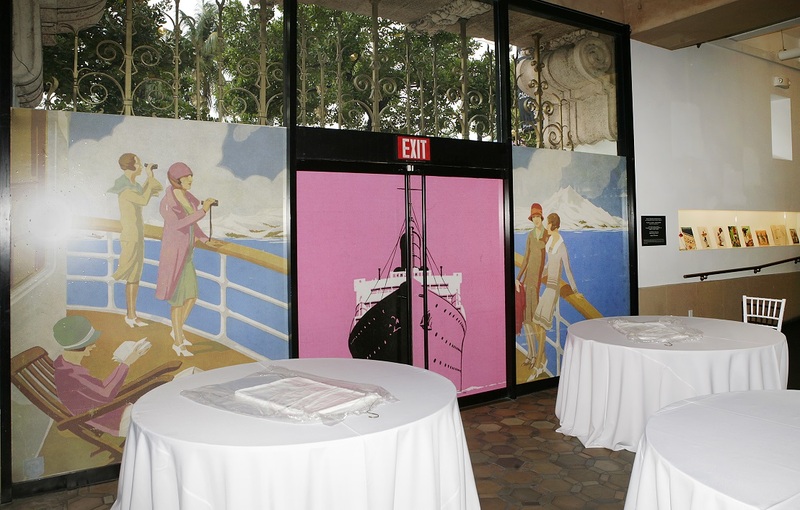 Before our dinner guests came aboard, installers were busy decorating our front door entryway with images selected from our extensive holdings of vintage ocean liner brochures. 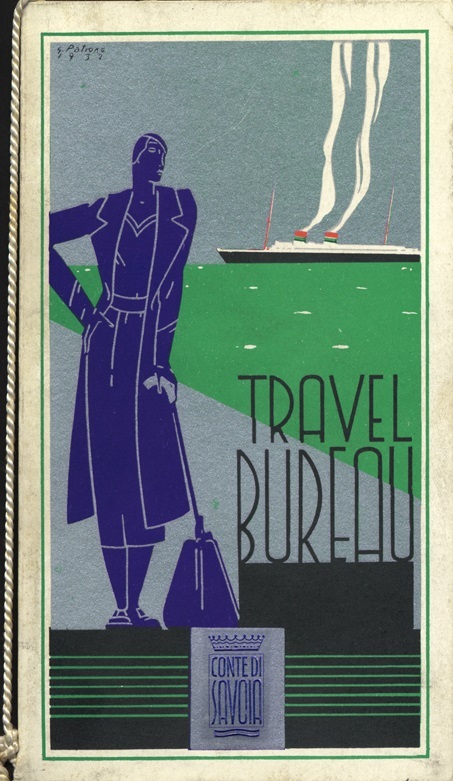 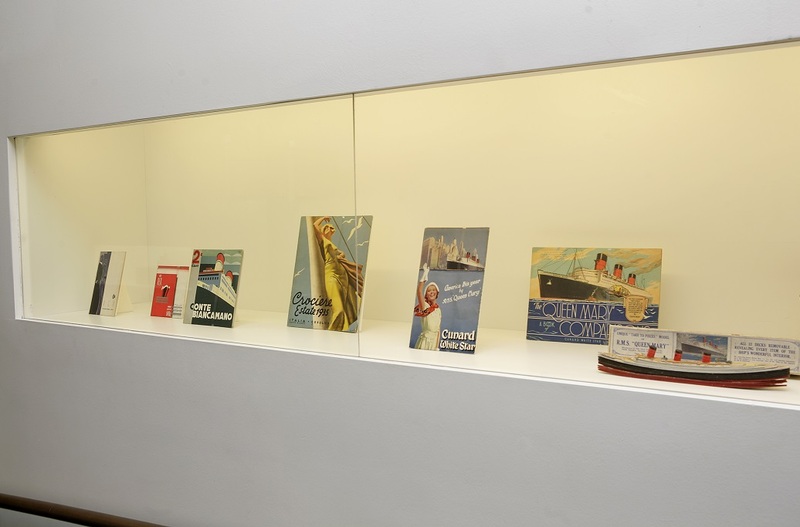 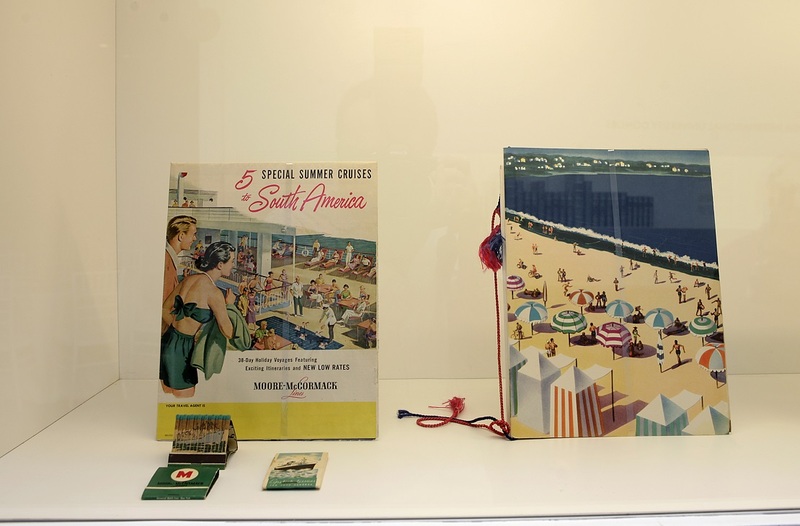 Curator Silvia Barisione and I also chose historic ocean liner menus, advertisements, and even a Queen Mary purse from the collection to go on display. 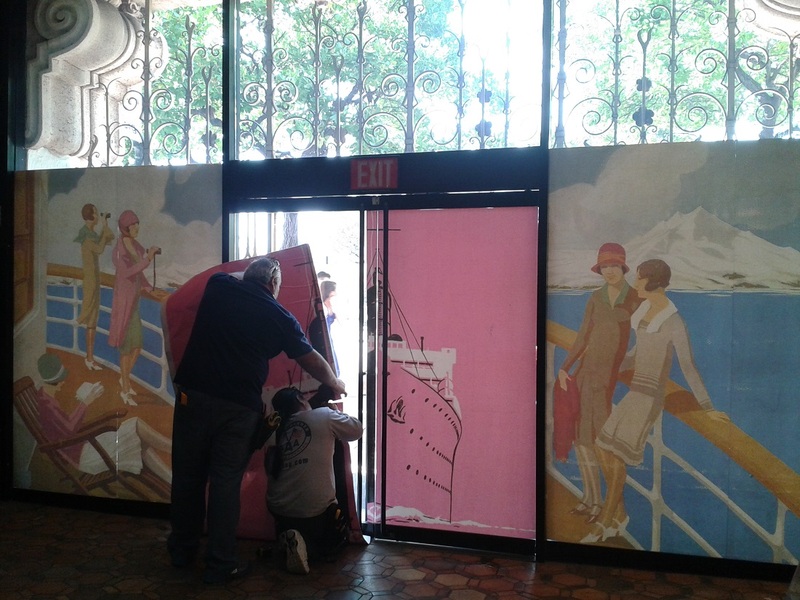 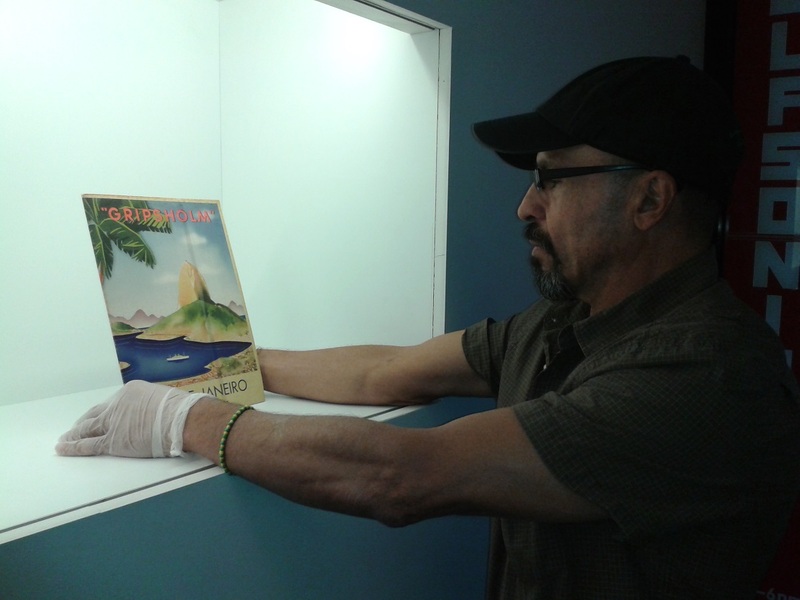 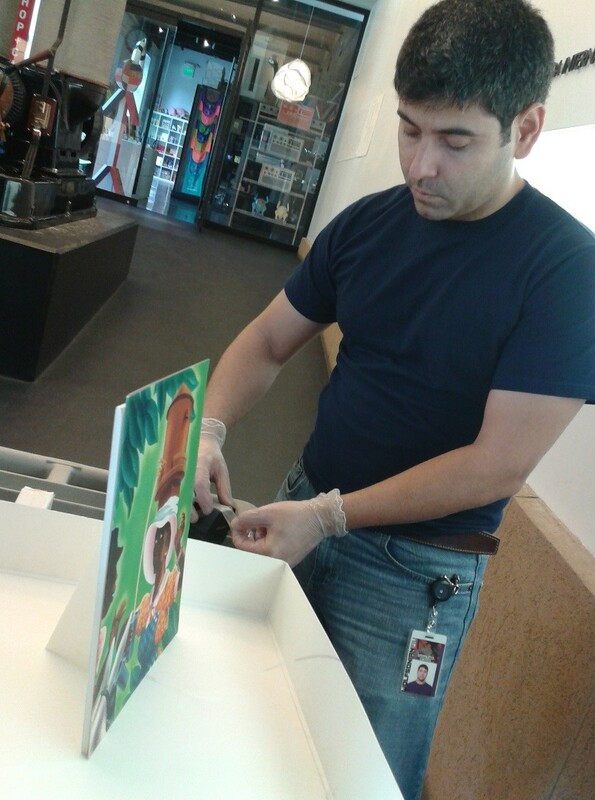 The morning of the event, I worked with our art handlers Steve Forero-Paz and Carlos Prado, and exhibition designer Richard Miltner to install the materials in the cases along the walkway leading into the Dynamo café. 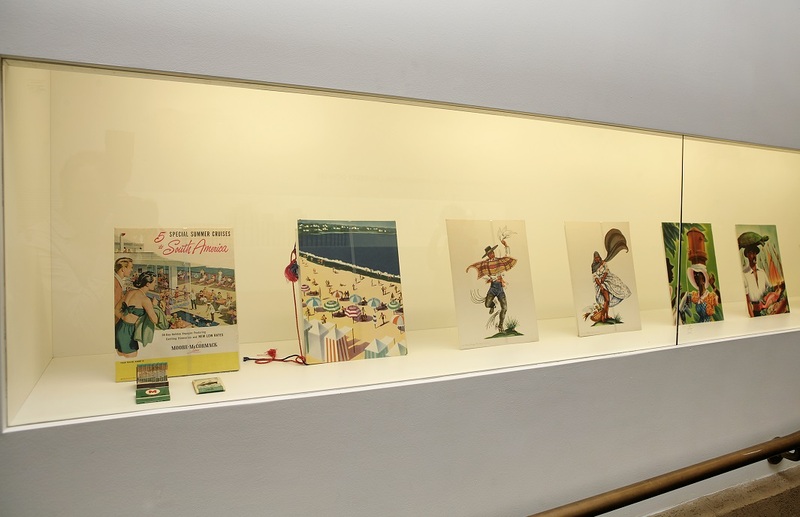 Hours before the guests arrived, the items were all installed and ready for viewing. 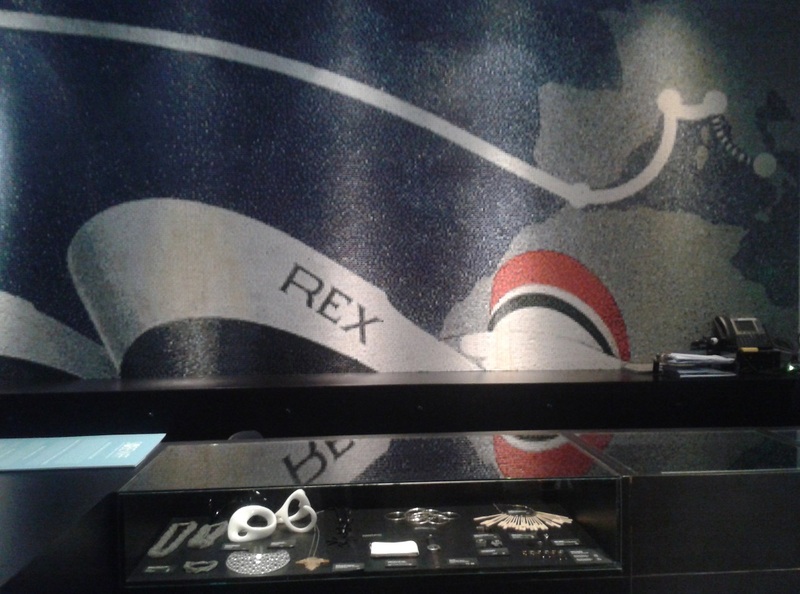 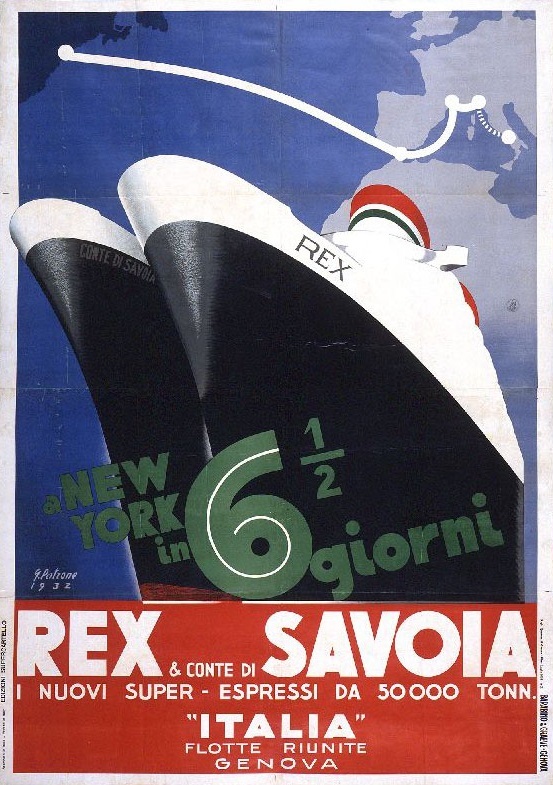 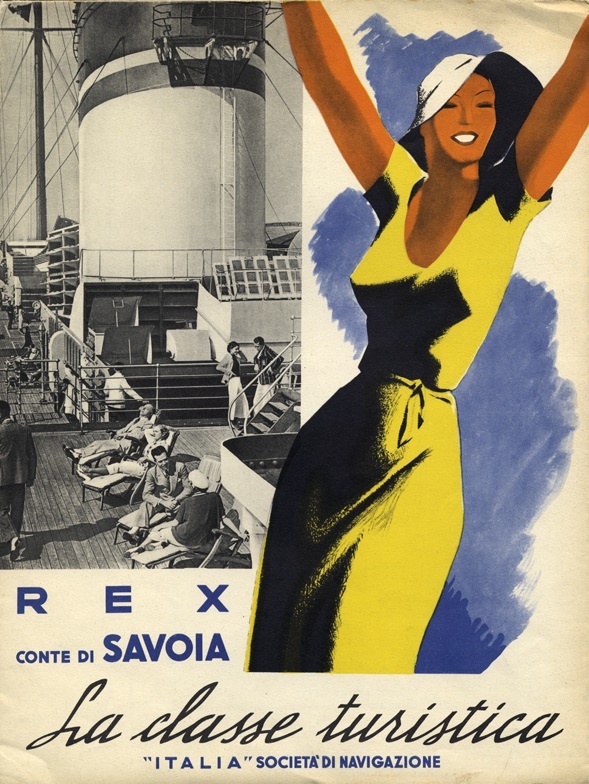 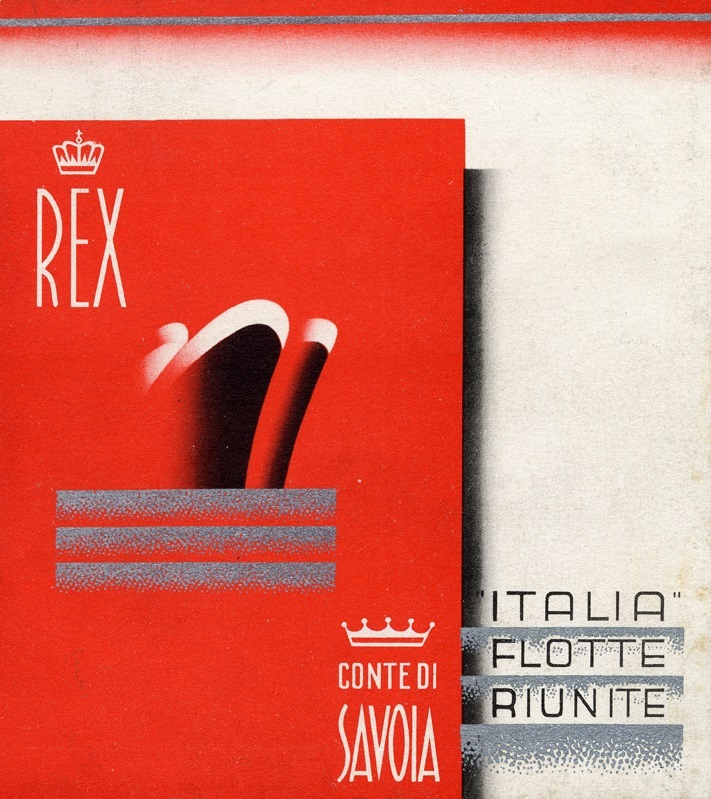 While relaxing and chatting over drinks and hors d’oeuvres in the café, our guests had the opportunity to see on one wall the ocean liner mosaic inspired by one of our vintage posters promoting travel aboard the great Italian liner, Rex. 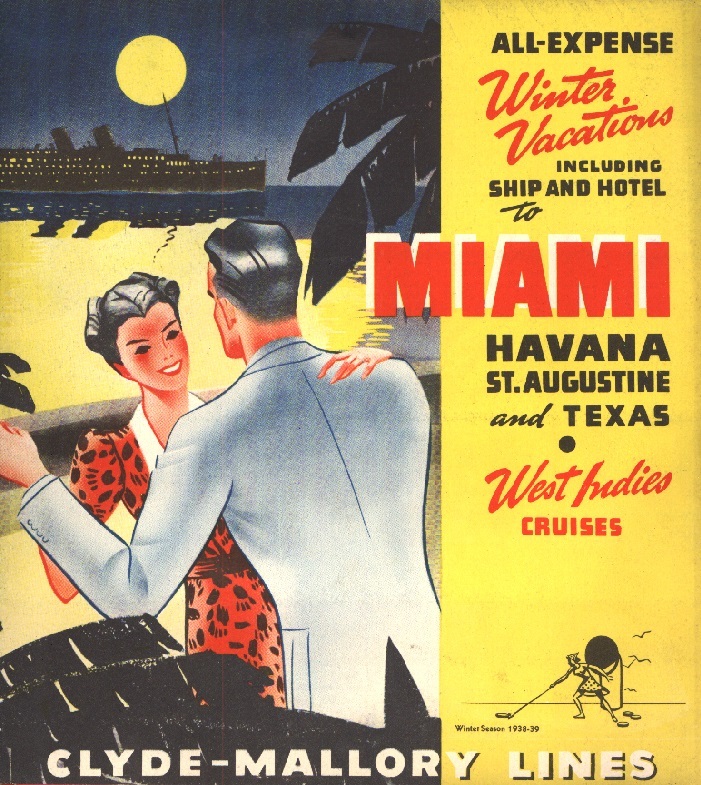 I had also selected and burned some images of brochures from the library collection onto a disk to provide the guests with a slide show of more than fifty brochures and other print ephemera from the Mitchell Wolfson, Jr. collection held in our library and will end today’s posting with a sampling of these as well. 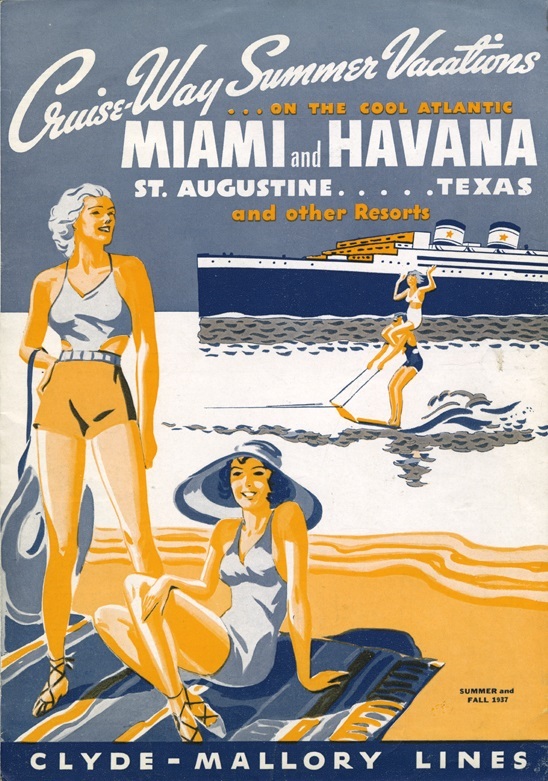 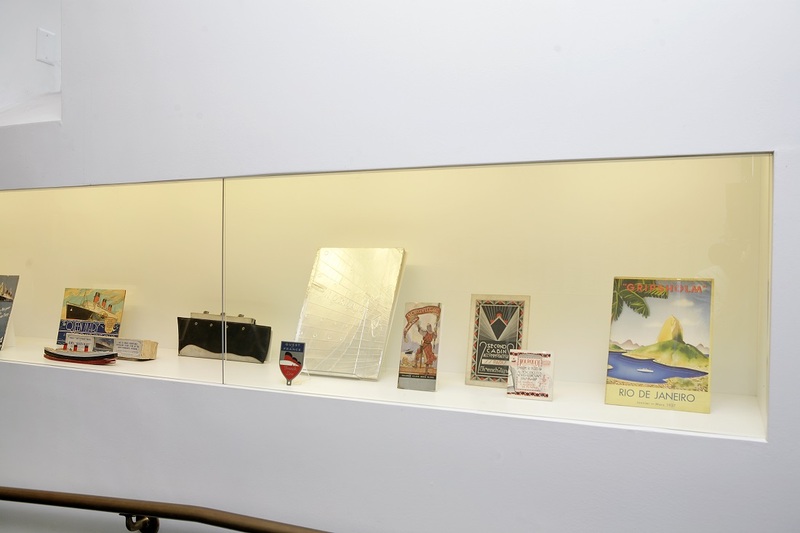 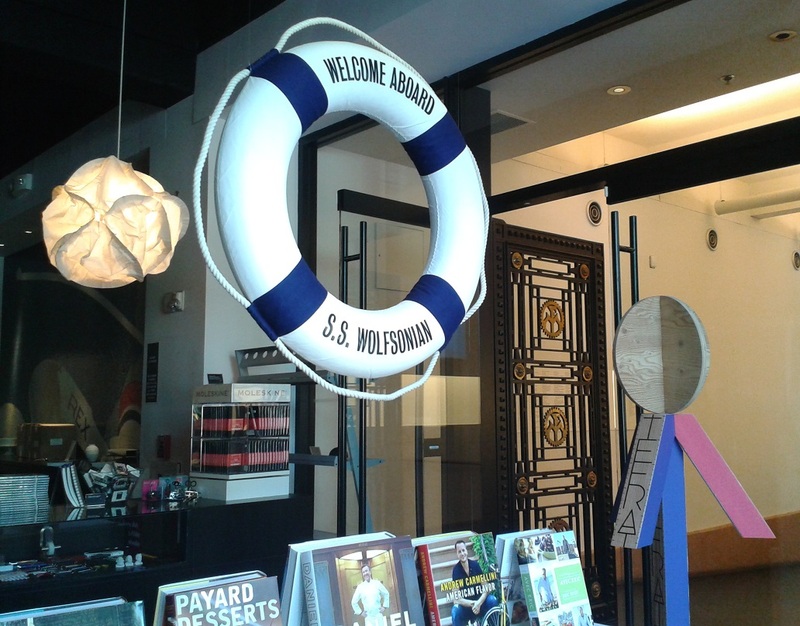 We gratefully acknowledge Mitchell Wolfson, Jr., Thomas C. Ragan, and Laurence A. Miller for their generous gifts to the collection, which have helped make The Wolfsonian-FIU one of the foremost public repositories of ocean and cruise-related materials from the interwar and postwar periods. 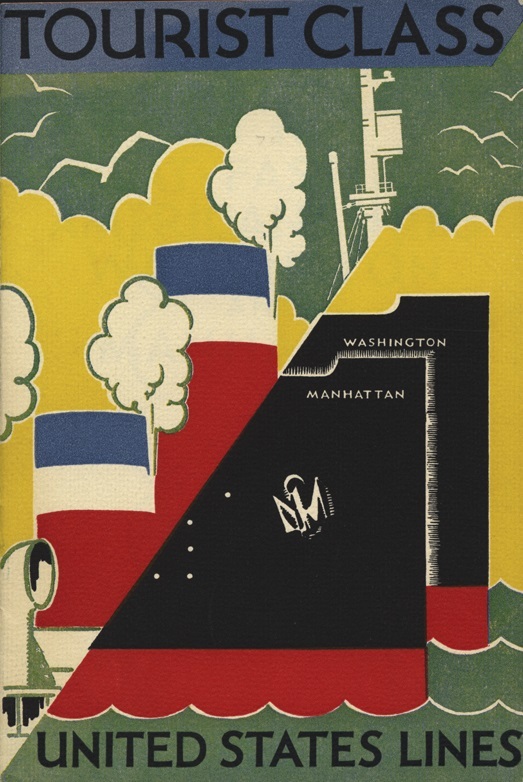 ~ by "The Chief" on February 25, 2014.